Pembrey Forest0300 065 3000work Forest or WoodlandLying between the town of Pembrey and Cefn Sidan Sands is Pembrey forest, one of Britain's sand dune forests. The forest is classified as a Nature Reserve and covers 1000 hectares. It is home to many rare botanical species, 35 species of butterfly, many migrant songbirds as well as birds of prey which include sparrowhawk and goshawk. 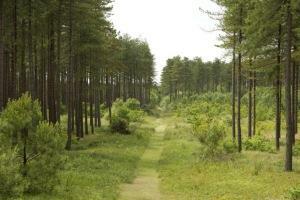 Pembrey forest also forms part of a Site of Special Scientific Interest. Occasionally the site is closed in extreme weather, such as high winds or snow and ice due to the risk of injury to visitors or to undertake maintenance work or forest operations. Please always follow any instructions onsite and make sure you follow any temporary diversion signs in place. By Car: Follow signs to Pembrey Country Park from the A484 road on the Kidwelly side of Pembrey, near Burry Port. Continue from the Park entrance to the Visitor Centre car park. There is a charge at the park entrance. Pembrey is the nearest town or village.